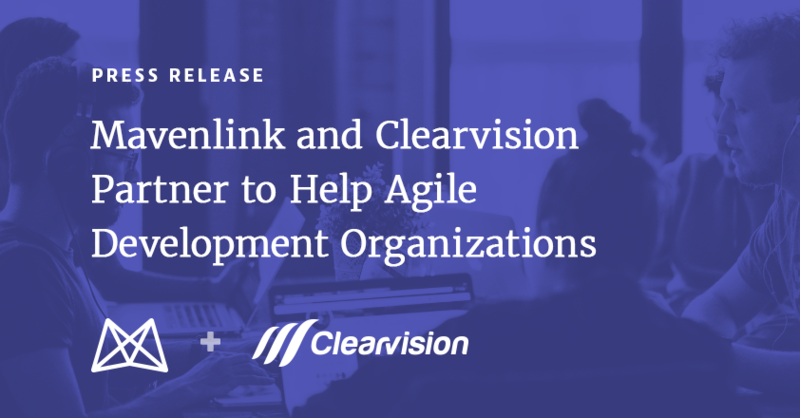 IRVINE, California, and Southampton, Hampshire (UK) April 2, 2019 — Mavenlink, the leading provider of cloud-based software for the modern services organization, and Clearvision, a Platinum Atlassian solutions partner, who offer specialist tools, solutions, services and resources today announced a partnership that will enable joint customers using Atlassian Jira—the number one software development tool used by agile teams—to better manage the business of agile development. Leveraging Mavenlink’s integrated solution for Jira, agile teams are able to gain unrivaled visibility and control over software development project portfolios, financials, and resourcing information. As an Atlassian Platinum Solution Partner, Clearvision provides business solutions through a combination of consultancy, technical implementation, hosting, training, mentoring and support packages for the entire Atlassian stack. Clearvision takes pride in enabling teams to reach their full potential, and has helped customers ranging from multinational enterprises to start-ups, government departments, retailers, software companies and more. ClearHub is a sister company of Clearvision, responsible for connecting the world’s top technical talent with businesses around the globe. ClearHub’s expert contractors help teams develop their skill sets to improve business functionality overall. To start making the most of your teams and tools today, head over to https://www.clearvision-cm.com/.